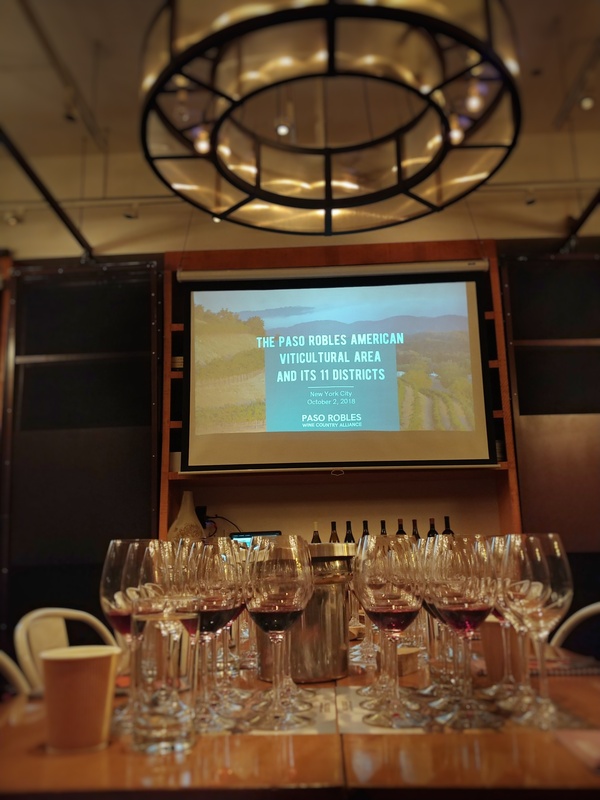 Around a month ago, just before the Paso Robles masterclass kicked off here in New York City, I was able to hear the story of renowned importer Robert Haas, who passed away earlier this year, as told by Robert’s son, Jason Haas. We had a small group discussion about how Jason’s grandfather owned Lehmann Bros., one of the first Manhattan retail shops to receive an alcohol sales license after Prohibition, and which eventually became Sherry-Lehmann; when Jason’s father graduated from college in 1950, he was sent to France to seek out producers that could be sold in the family’s retail store. In 1966, Robert Haas, who became an advocate for the wines from Alsace, Burgundy, and the Rhône Valley, started a relationship with the Perrin family, owners of Château de Beaucastel in Châteauneuf du Pape (in France’s southern Rhône Valley) that would become an important partnership with Tablas Creek Vineyard, in Paso Robles, and directly increase the quality of US wines made from Rhône grape varieties. Winemaking and wine grape growing actually started in the Santa Margarita Ranch area (today part of the Paso Robles AVA) in 1790 by Franciscan Friars. Eventually, in 1983, Paso Robles became an AVA (American Viticultural Area) and it was one of the largest un-subdivided AVAs in California, over 600,000 acres (243,000 hectares) with 40,000 acres (16,200 hectares) planted with vines, until 2014 when it was officially declared to have 11 sub-AVAs. The declaration of these already locally known sub-AVAs was a big step in regards to publicly acknowledging the diversity of sense of place (aka terroir) as well as brought to the forefront that there were a multitude of wine specialists in Paso Robles excelling in various types of varieties and styles. I have to admit that from my own perspective, I knew very little about Paso Robles, and I was more familiar with the nuanced differences of Burgundy villages and Barolo communes as my past New York City wine experiences had a major focus on European wines. 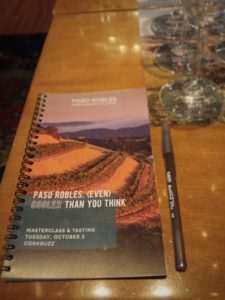 But Paso Robles, which is dead center in between San Francisco and Los Angeles, not only has a range of soils (over 30 parent soil series) with it having the most amount of calcareous and siliceous soils in California but it also has some of the most extreme swings in temperatures, with a 60 degree swing happening just a week before the masterclass, 104 F (40 C) to 42 F (5 C); these factors ripen the grapes to the point where one can “taste the sun and fruit” yet retains the acids for freshness and allows for longer hang times that helps with phenolic ripeness of the skins and seeds. The Paso soils (majority calcareous, siliceous and clay) contribute to a high pH that helps to produce quality wine, in some instances, such as Giornata’s Nebbiolo growing smaller grape bunches that are like the ones produced in Piedmont. The top Paso Robles wines express an aromatic and textural complexity that are breathtakingly enticing in their generosity and overall sense of finesse. Despite only having 6% of vineyards planted with old Zinfandel, Paso Robles is still seen by many wine drinkers as a place for big, lush Zins. But there is so much more to Paso, such as Italian wine specialist winemakers like the producer Giornata. 49% of the area is planted with Cabernet Sauvignon and offers bang for buck value when it comes to well-balanced Cab wines (example Ancient Peaks Winery Cabernet Sauvignon retailing for $22), and it is the heartland of American Rhône varieties due to the great investment that Tablas Creek Vineyard placed into the area. 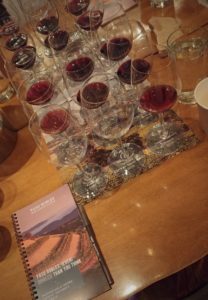 Tablas Creek Vineyard was established in 1989 (included in the Paso Robles AVA in 1993) by the father of Jason Haas, Robert, and the Perrin family, the owners of Château de Beaucastel, as stated above. As one can imagine, many people in the wine world wondered where the eminent importer Robert Haas and the iconic Perrin family would lay down roots in California when their search became known. Jason said that even though the world was shocked when they picked Paso Robles, no one was more shocked with the outcome than the Haas and Perrin families. At first this dynamic partnership thought Sonoma would be the ideal place for their New World wine endeavor but when they discovered the calcareous soils of Paso (also found in the sub-soils of Châteauneuf du Pape), as well as the opportunity for dry farming (Paso soils absorb winter rainfall for distribution during the growing season), and Paso’s extreme swings in temperatures which are ideal for late ripening Rhône varieties such as Roussanne and Mourvèdre, they knew Paso was the idea place for them. And despite having hotter days than Châteauneuf du Pape, Paso Robles has cooler nights and so the overall average temperature in Paso is slighter lower. 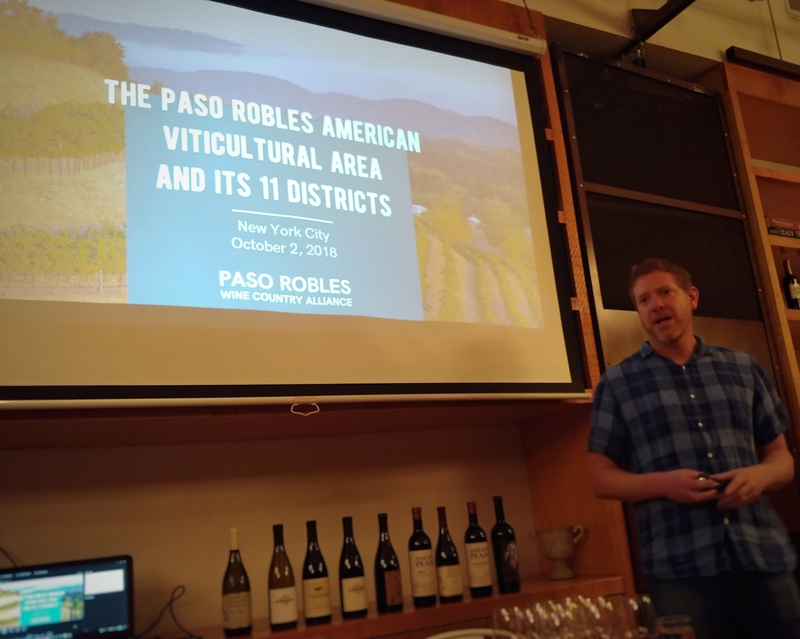 As the seminar progressed and I kept hearing other Paso Robles wine producers talking about using cuttings from Tablas Creek to start their vineyards, I had to ask Jason Haas how many producers used cuttings that were originally brought over by his family’s winery. Jason first started off, this slight detour in the conversation created by myself, by saying that his father and the Perrin family members knew that the biggest thing holding back quality wines based on Rhône varieties in California was the raw material. And so Tablas Creek first started a grape vine nursery before they started to actually make wine. They brought in 6 cuttings of each type of clone (as that is what the US government allowed for mandated quarantine reasons) and then they reproduced these clones to plant for themselves. Well, once US producers heard about their superior clones from the motherland, they wanted to purchase them. A conscious decision was made by Jason’s father and his partners that they should not make these clones proprietary, despite potentially giving them a huge competitive edge in the marketplace, as they wanted the quality bar of US Rhône wines to significantly improve across the board. Over the last 20 years, the Tablas Creek nursery has sold 5 million grape vines to more than 600 vineyards up and down the West Coast, from Paso Robles to Washington State. When we choose to have a competitive edge over community, despite being able to superficially thrive as an individual, we betray our inner life, as the inner life of a person’s spirit cannot continue to exist if there in no connection to community. I know that to be true because even though I had no resources, family, or anyone to teach me survival skills when I first came to New York City when I was 18, I immediately realized that the diverse, lower income community that I lived in would have my back – just like I would have theirs. And please don’t get me wrong – I would never recommend any 18 year old to do what I did, but in my case I had no choice, but it was an incredible lesson in the idea that life is so much more fulfilling when you realize that you will not end up on the streets because of your neighbors, and most importantly, that most of us need very little to make us happy when we have a community to support us. Now, 25 years later, I find myself as a struggling middle class person running into too many people who seem depressed because they are desperately trying to find validation through an outward success of being in the top of their field while at the same time feel disconnected to those around them. Please don’t take these statements as judgment because I can see how the world around us forces the aspirational middle class to base their worth on achievements, and what we own in comparison to others; that has little to do with inner values and ethics, and all of us fight every day to find a sense of worth in a world that subliminally tells us that we are worthless. Amongst the fierce turmoil in the US, I still feel proud of certain aspects of our society. We certainly take the idea of freedom to the ultimate level… it can be wondrous at times… and horrifying at others. But I know I wouldn’t be the person I am today, especially considering my lack of family background, if I wasn’t in the US. But where the United States of America is failing many of its citizens is in its lack of community in pockets throughout the country… community allows us to trust that no one, or no company, will cross boundaries in their desire for success where it becomes detrimental to the society as a whole… but ideally this is done by the free will of others knowing there is only one type of success – uplifting the community. This is something that Tablas Creek knew from the beginning and still continues to place their energies into… there is a reason why the blog on their website has won many awards (I have been an avid reader for years) – because they openly share their knowledge, and passionately wave the flag for Paso Robles. When we try to climb every mountain ourselves we set ourselves up for disaster… but when we realize that there are many mountains we cannot climb, and if we can at least assist others in those achievements, we will always be successful. –2017 Giornata, Fiano: (SRP $30) 80% Fiano, 13% Trebbiano, and 7% Falanghina. 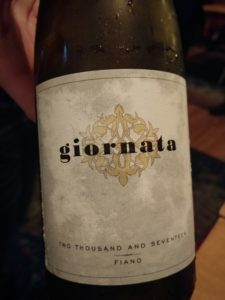 This wine was zesty from first sniff with citrus peel and intensely wet stones that had peach pit on the palate with lots of bright energy and a slightly bitter finish, as one always expects with Italian whites. Co-owner Brian Terrizzi was there to talk about his winery and he said that once they got some publicity for producing wines made from Italian varieties, many Paso Robles grape growers who grew Italian grape varieties started coming out of the woodwork to approach Brian and his wife Stephanie (who manages some properties that have Italian grape varieties) about purchasing vineyards. This lost Fiano vineyard wasn’t really being farmed as it was part of a divorce settlement. Brian said he wants the variety and place to speak for itself so he does very little to the wine with minimal amounts of SO2. A small percentage of Trebbiano and Falanghina are added to top it up because the Fiano is a small property. They sell out of this wine really quickly – only 70 cases are currently made and they are hoping to increase production by a couple hundred cases. 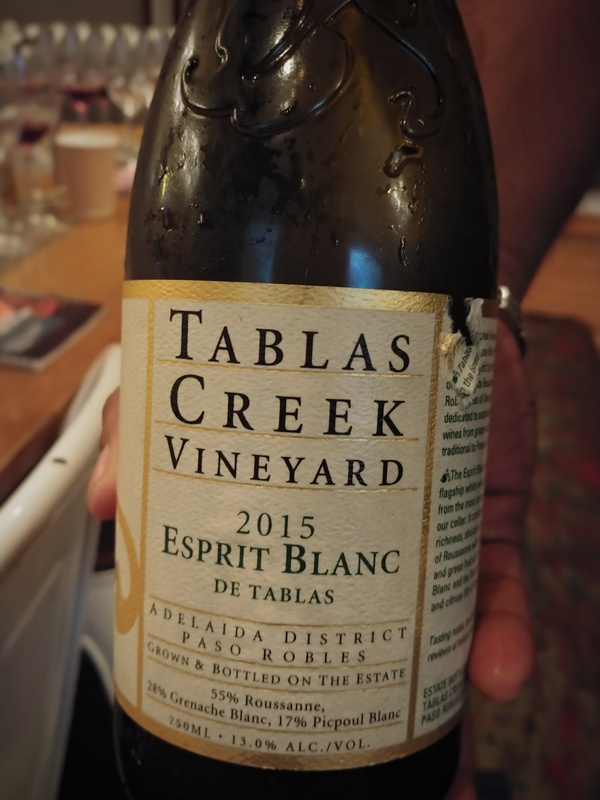 –2015 Tablas Creek Vineyard, Esprit de Tablas Blanc: (SRP $45) 55% Roussanne, 28% Grenache Blanc and 17% Picpoul Blanc. I have tasted the Esprit de Tablas wines many times as they are the iconic wines from this area that are stylistically like the great Château de Beaucastel wine, yet with more of a Paso edge. This white blend was multidimensional with honey covered juicy stone fruits, white flowers and nutmeg with a fleshy body that had a shock of electric energy on the finish. Based on Château de Beaucastel Roussanne wine (honeyed, rich) yet with more acid and brightness added by the Picpoul. This wine is treated like a red wine and fermented in 1200 gallon size fermenters (foudres aka large wooden vats), then bottled for a time, and then it goes back to barrels to age. Tablas Creek is certified biodynamic and organic and Château de Beaucastel has been organic since the 1960s. -2015 Thacher Winery, Cinsault: (SRP $42) 100% Cinsault. Such a treat to taste a 100% Cinsault, especially when it is fermented as whole grape clusters because it illustrates how this grape can be the “Pinot of the Desert”. The nose was so alive with sweet red cherries and perfume with a sharp, linear body that made it fierce and fun at the same time. This wine is from the Glenrose Vineyard in Adelaida District, a cooler, higher elevation sub-AVA in Paso Robles (Tablas Creek is located there). Hand harvested, foot trodden, native fermentation, bottled after 12 months un-fined and un-filtered, minimal SO2, no additives, no enzymes or no nutrients added. 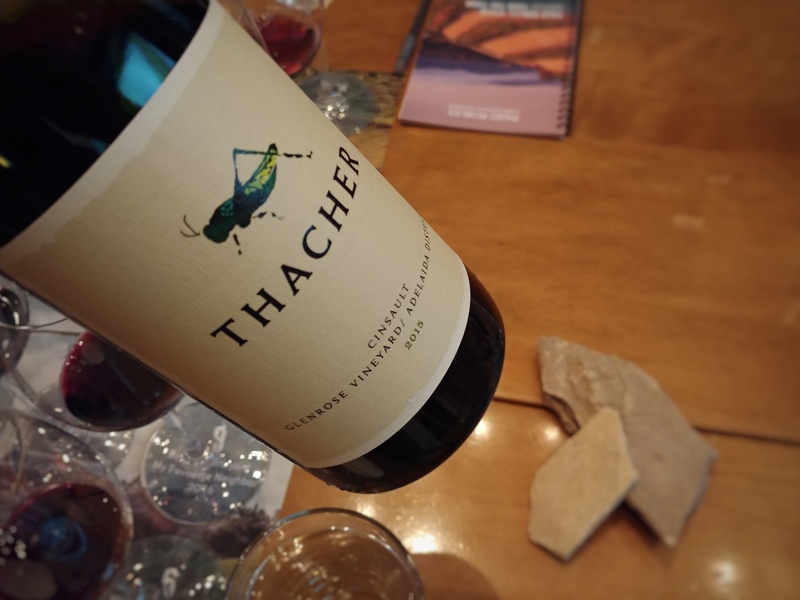 Recently Thacher has changed direction into a more natural direction – they sell 95% of this wine direct to consumer as there is a cult following for it. Glenrose is a crazy vineyard where the owner terraced it because it was too steep and it now looks like a ziggurat. Unfortunately, the owner of the vineyard didn’t realize he would need to take off the topsoil when terracing, and so the vines are chiseled into the limestone bedrock and the pH was too high for the vines, and so then he had to run sulfuric acid through his irrigation lines so his vines would take up nutrients. Now if that is not commitment and passion I don’t know what is! Most of this vineyard is planted with cuttings from Tablas Creek. 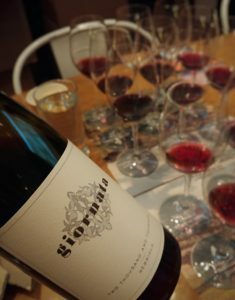 –2014 Giornata, Nebbiolo: (SRP $45) 100% Nebbiolo. Nebbiolo from Paso Robles! Say WHAT?! But you better believe this baby from Giornata delivered with rose oil, mushroom, dried herbs and hints of cherry with marked acidity and tannins that formed an intricate lace in the body of the wine. Nebbiolo loves the higher pH in the soils that Giornata has selected. Brian and Stephanie Terrizzi started with a barrel of Nebbiolo in 2005 as Stephanie was managing a vineyard of Nebbiolo at the time. This wine comes from the Luna Matta Vineyard which is 1,750 feet (533 meters) high and Brian said that they believe the climate and soil conditions are similar to those of Piedmont. No manipulation in the winery as Brian said that he wants the drinker to identify it as Nebbiolo. –2016 Ancient Peaks Winery, Merlot: (SRP $20) 100% Merlot. Cocoa dust intermingled with espresso with an interesting smoky note that had fresh plums on the finish, and all for only $20. Amanda Wittstrom-Higgins, VP of Operations for Ancient Peaks Winery, is a 4th generation Paso Robles resident, and as well as working for Ancient Peaks (2nd generation winery) for 12 years, is part of the family of one of the owners. The families that own this winery are proprietors of 14,000 acres (5700 hectares) in Santa Margarita Ranch AVA (takes up 50% of this sub-AVA) which is in the southern most part of Paso Robles, near the Pacific. There are just under 1000 acres (405 hectares) planted (the rest is cattle ranch) and Amanda said that when you are in the vineyards the only thing you see is vineyards and the Santa Lucia Range. Their vineyard is mainly planted to Cabernet Sauvignon and Merlot as those are their biggest sellers, but they have 70 different blocks delineated with 17 different varieties and they plant vines for smaller producers such as the Sangiovese and Nebbiolo vines they are planting for Brian Terrizzi (Giornata) who will use these grapes for his new project called Broadside. Also, Amanda talked about the importance of Tablas Creek helping to bring quality grape growing to the Paso area with their research, investing, spreading the word, and how much it has meant to their community. As she said, there was not a lot of hope for development of an economy with the generations that came before her. 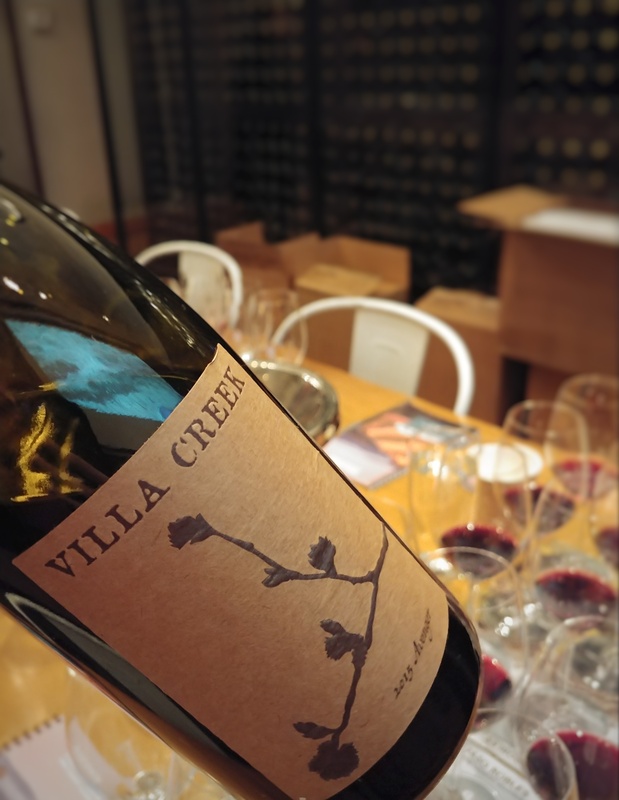 –2015 Villa Creek Cellars, Avenger: (SRP $55) 70% Syrah, 10% Petite Sirah, 10% Grenache, 10% Mourvèdre. As a Syrah lover, I really liked the chewy tannins that had broad shoulders with BBQ smoke notes that were balanced by a juicy finish. Most of the fruit for this wine is sustainable based in the Willow Creek District which is also a higher and cooler area in Paso Robles and is known for super star cult Rhône producers. 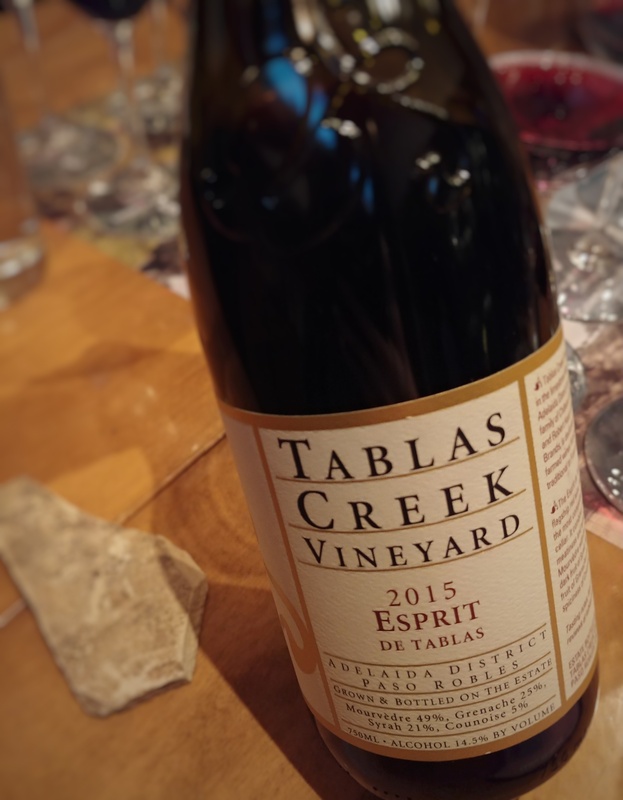 –2015 Tablas Creek Vineyard, Esprit de Tablas: (SRP $55) 49% Mourvèdre, 25% Grenache, 21% Syrah and 5% Counoise. Overall breathtaking balance, savory and sweet with truffles and sweet red cherries, and an underlying intense minerality that was lifted by the bright finish. I can’t remember the last time I had a Rhône blend, especially Mourvèdre dominant, that had such finesse within its decadent deliciousness! The winery practices are similar to their white Esprit de Tablas. 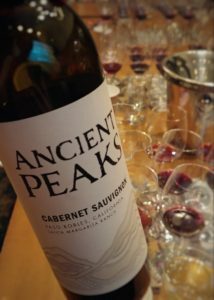 –2016 Ancient Peaks Winery, Cabernet Sauvignon: (SRP $22) 83% Cabernet Sauvignon, 14% Petit Verdot and 3% Petite Sirah. I noticed the cooling influences during the night with dried thyme that had black berries with a gravelly finish. The noticeable structural shape on this Cab brought this mid-level wine to another dimension of enjoyment. Again, Ancient Peaks price is astonishing at $22. 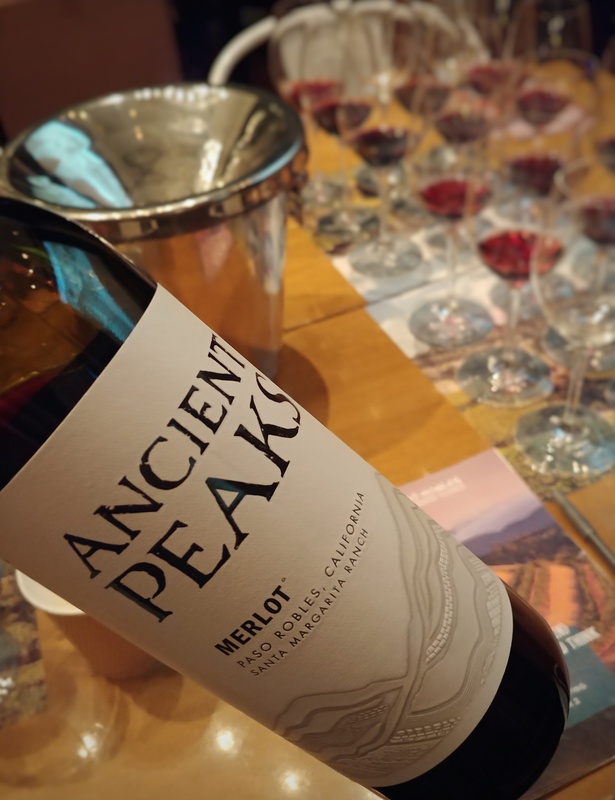 Cabernet Sauvignon is the variety planted the most at Ancient Peaks with just under 300 acres (121 hectares) and they are looking to plant more Cab with Petit Verdot being an important variety to blend that helps to give structure. 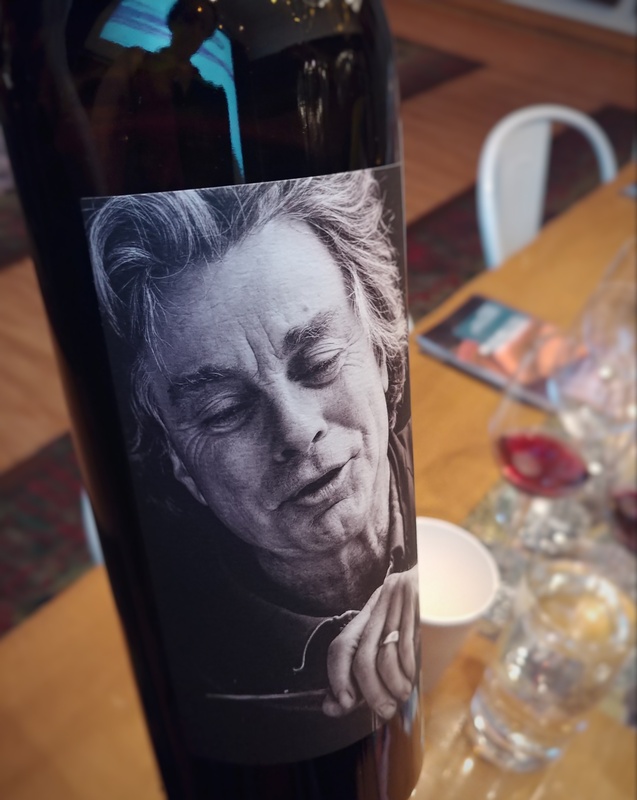 –2016 Booker Vineyard, My Favorite Neighbor: (SRP $80) 69% Cabernet Sauvignon, 20% Syrah, and 11% Petit Verdot. Peppery nose with a plush body that evolved with layers of complexity that included sweet tobacco leaf and pencil shavings that were fleshed out with ripe blackcurrant flavors that had brawny tannins that had just enough give to make it a wine that begs for another sip. Booker Vineyard is owned by Eric and Lisa Jensen and their fine wine selection of “My Favorite Neighbor” pays tribute to those people in their community who have meant a lot to them. The 2016 is a label that depicts Stephan Asseo of L’Aventure Wines – the Jensens worked for Stephan right before they decided to start their own winery. It may seem unconventional to place a rival wine producer on one’s label but that seems to be the beautiful Paso way. -Like Napa, there is a conjunctive labeling law that states if a winery uses one of the AVAs that are entirely enclosed within Paso Robles that they also need to note on the label Paso Robles AVA (Example: Tablas Creek Vineyard wines will say “Adelaida District” and “Paso Robles”). -The coolest part of Paso Robles is in the south and it becomes warmer in the north but all of the areas get drastic swings in temperatures. -The Paso Robles soil will absorb water during the winter, gaining up to 50% more weight per unit volume, and gives the water back to the vines when they need it during the growing season. -Paso Robles spans 6 miles (9.7 kilometers) from the Pacific Ocean to 40 miles (64 kilometers) from the Pacific Ocean – so there is a fair amount of range east to west and there is almost as much distance north to south, 30-ish miles (around 48 kilometers). -The calcareous and siliceous soils in Paso Robles were created by the old Pacific seabed being pushed up when the Santa Lucia Mountains were created. -One of the wettest vintages in Paso Robles was 2015 when a Hurricane got lost and dropped a significant amount of water over the Paso area in July of that year. -Desert conditions in the summer and wet in the winter, especially on the western side. -Paso Robles AVA (American Viticultural Area) was established in 1983 with 17 wineries and 5,000 acres (2023 hectares) of vineyards and today has over 200 wineries and 40,000 acres (16,200 hectares) of planted vines.